The Red Army's real Helmet. 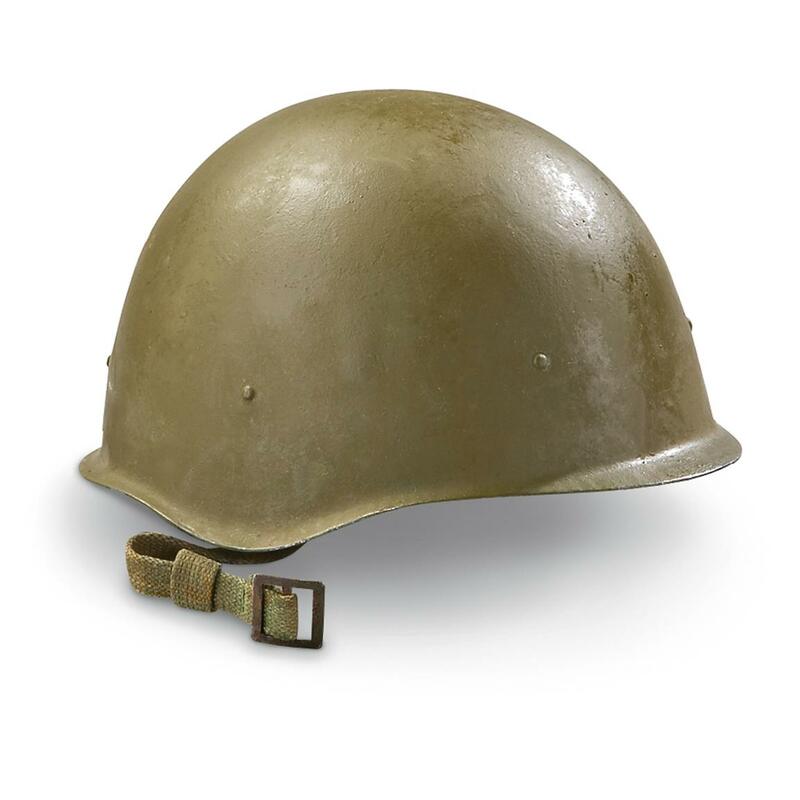 The Russians vowed to never give up, and this is the Helmet worn by Russian troops as they fought back against Germany. Weighs 2 lbs., 14 oz. Weighs: 2 lbs., 14 oz. Russian Military Surplus WWII Helmet, Olive Drab, Used is rated 4.7 out of 5 by 30. Rated 5 out of 5 by Jim K from Great Price!!! A Christmas gift for mt grandson, and he will likely wear it all day. Rated 5 out of 5 by Roger from Very nice helmet This appears to be an SSh 40 helmet. It looks either new or refurbished. Inside it is marked "954" which I guess is 1954. I have a large head - think near 60 on the European scale and this helmet fits. So I am happy with it. Rated 3 out of 5 by TomServo5 from Nice item for price but NOT WWII Very good condition with typical wear and storage marks. Chinstrap and liner also in very good shape. Unfortunately these were listed as WWII and are missing stamps and other markings to verify this. Another issue is they are all "small" size or 1. Has the look though and will be good in display case or with other Russian items. Rated 4 out of 5 by Panzergrenadier from great price! It goes along with the WWII Russian uniform I ordered last month. Rated 5 out of 5 by Ashes from Excellent condition Helmet arrived in much better condition then expected. Rated 5 out of 5 by Oldmauserman from Quality Product The hemmet i received was definitely post-War, but I expected that. The helmet, liner, and strap are all in great shape, and once dust was removed, it was ready for photographs with the SKS and Mosins. Rated 5 out of 5 by Macker308 from Reissued Russian WWII Helmet These are reissued Russian helmet, mine was marked 56, for 1956. It was still made back in the 40's it just has new paint. Overall very nice piece of history at a very reasonable price! So snap them up while you still can!! Dependable timekeepers at a great price. Headstrong protection and military glory. Runs Bigaria-label="A rating of 1 means too small, a rating of 5 means too big, a rating of 3 means true to size. This items average rating is 4.0.